One glance at that table and you can already conclude that Greenback bashing was a major theme this week, since 7 of the top 10 movers are Greenback pairs, with the Greenback losing all the way. What’s up with that? Why was the U.S. dollar so weak? And what about the other currencies? How did they fare this week? Time to find out! As mentioned earlier, 7 of the top 10 movers are Greenback pairs, with the Greenback getting its behind kicked in all of them. It therefore goes without saying that the Greenback had a really, really bad week this week. Interestingly enough and despite last week’s rather poor NFP report, the Greenback actually had a steady start, with the exception of the gaps on USD/CHF and USD/JPY. Selling pressure on the Greenback began to mount starting on Tuesday, though, as news began to spread that Hurricane Irma would follow in Hurricane Harvey’s wake. However, the Greenback began to really feel the pain across the board later on, thanks to the one-two punch from disappointing U.S. factory orders and dovish rhetoric from Fed Governor Brainard. You see, U.S. Fed Governor Lael Brainard reiterated her dovish stance that the Fed really needs to take a closer look at underlying inflation before hiking interest rates again. As for U.S. factory orders during the July period, it only served to reinforce the dovish rhetoric from Brainard and others because it printed a rather steep 3.3% month-on-month drop, which negated the 3.2% increase back in June. The details were a bit less disappointing, though, since capital goods rose by 1.0% and the drop in factory orders was mainly due to weaker demand for transportation equipment, which tends to be volatile. Moving on, the Greenback’s price action was a bit more mixed on Wednesday, likely because of easing political jitters on news that Trump and his fellow Republicans agreed with the Democrats to extend the debt limit by three months in order to avoid a government shutdown, which likely reduced selling pressure on the Greenback. Heck, the Greenback was even tilting higher on some pairs. Unfortunately for the Greenback, signs of selling pressure began to show up again when FOMC Vice Chair Fischer announced his resignation “for personal reasons” during Wednesday’s U.S. session, which market analysts say further clouded the prospects for a future Fed rate hike. And things only got worse on Thursday since focus apparently shifted back to the damage inflicted by Hurricane Harvey and fears that Hurricane Irma may inflict just as much damage. These fears then continued to haunt the Greenback until Friday, market analysts say. The Greenback did find some respite later when Friday’s U.S. session finally rolled around, though, since New York Fed President William Dudley’s CNBC interview was aired. In that interview, Dudley affirmed everyone’s fears that the the damage from Hurricane Harvey and expected damage from Hurricane Irma will probably be bad for Q3 growth. And either as a reaction to Dudley’s somewhat upbeat remark or just short-covering to avoid weekend risk, the Greenback ended up clawing its way higher. The damage was already done, though, and so the Greenback closed out the trading as the worst-performing currency of them all. The euro was mixed but a net loser this week. And while the euro’s price action looks like a modern art masterpiece, it does show more uniformity if we simply strip EUR/CAD. As you can see above, the euro drifted lower on Monday and Tuesday, even though there were no apparent negative catalysts. Some market analysts were blaming the euro’s weakness during this period to unwinding by bulls and general lack of demand for the euro ahead of the ECB statement since there was a chance that the ECB may try to talk down the euro. The euro did bottom out on most pairs come Wednesday, even though there were no apparent catalysts. Preemptive positioning is a possibility, though, especially since the euro dipped a bit when the ECB announced that it was maintaining its current monetary policy, including its easing bias on its QE program, which were all widely expected. 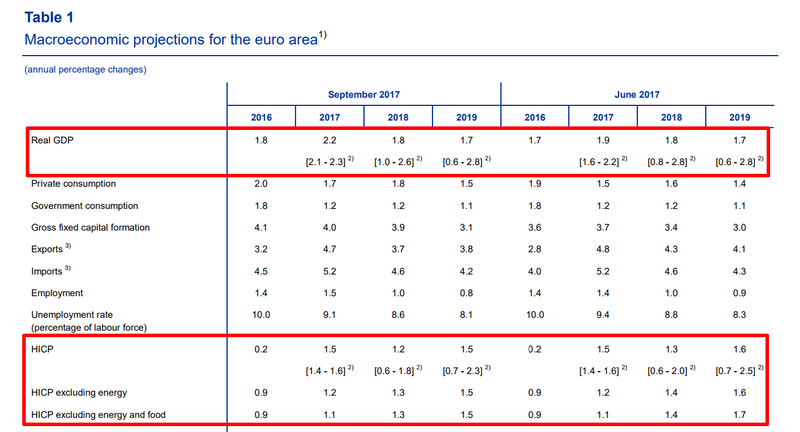 In short, the stronger euro has led to lowered inflation forecasts, but the revisions were minor enough that the ECB considered then “broadly unchanged.” Also, the stronger euro has led to tighter financial conditions in the euro area, but they’re not too tight yet, which is a subtle way of saying that the ECB’s is concerned with the euro’s strength this year, but not yet all that worried. Anyhow, promising signs of an early taper and not-so-severe jawboning on the euro were all that the euro bulls needed to charge in. However, there was no follow-through buying after that, and so the euro’s price action became a total mess, which means that opposing currencies were dictating price action on euro pairs. The pound had a mixed performance this week, but was still a net winner overall. And while, the pound’s price action looks kinda chaotic, we get a clearer picture if we remove GBP/CAD. Looking at the overlay of GBP pairs above, the pound dipped slightly at the start of the week, likely because of Brexit-related jitters when British PM Theresa May warned over the weekend that the U.K. faces a “cliff edge” if MPs vote against the E.U. Repeal Bill. No worries, though, since Markit released the U.K.’s services PMI for the August period. The 53.2 reading was actually a slight miss from the 53.5 expected and is lower than the previous month’s 53.8 to boot, which is why the pound initially encountered selling pressure. Given that upbeat message on the labor market and inflation, it’s no real wonder that bulls ultimately won out and the pound began to trend broadly higher. Although some market analysts are of the opinion that Tuesday’s pound rally was also due to profit-taking by shorts ahead of next week’s BOE statement and the second reading of the E.U. Withdrawal Bill. Anyhow, the pound continued to gain strength before becoming more mixed but mostly weaker on Thursday, likely because pound bulls were taking profits off the table and were waiting on how MPs would vote on the Withdrawal Bill. Of course, we now know that the event was a dud because MPs couldn’t come to a meeting of the minds, so they agreed to continue the debate on Monday next week. The non-action on the part of the MPs did appear to attract fresh pound bulls, though, since the pound found support across the board ahead of Friday’s data dump. As for the specifics on Friday’s economic reports, total industrial production in the U.K. during the July period increased by 0.4% year-on-year as expected but faster than the previous month’s 0.3% rise. And the slightly stronger industrial output, in turn, was driven mainly by the 1.9% surge in manufacturing output, which is stronger than the +1.7% consensus and is significantly faster than the 0.6% rise during the previous month. Meanwhile, the U.K.’s trade data for the July period showed that U.K.’s trade gap narrowed from £2.91billion to £2.87 billion, even though the trade deficit in goods widened slightly from £11.53 billion to £11.58 billion. Although the wider deficit in goods isn’t really as disappointing since it’s still smaller than the expected deficit of £11.95 billion. Also, the overall trade deficit in Q2 was revised to be much smaller compared to Q1, which may lead to a possible upward revision for Q2 GDP growth. Unfortunately, construction output in the U.K. fell by 0.4% year-on-year instead of rising by 0.2% as expected while falling by 0.9% month-on-month, which marks the fourth consecutive month of negative readings. Overall, the data dump on Friday was net positive, which is likely why the pound kicked it into higher gear. However, the pound’s losses on Monday and Thursday effectively capped the pound’s gains, and so the pound ended up mixed this week. By the way, the U.K. will be releasing its CPI report and jobs report ahead of the BOE statement. And those top-tier economic reports will likely give the pound a volatility infusion ahead of the BOE statement itself. In any case, just keep an eye on the pound, since there’s a good chance that the pound will be one of the livelier currencies next week. The Swiss franc was the second strongest currency after the yen. And while the risk-off vibes certainly also helped the Swissy, as can be seen in the gaps at the start of the week, the Swissy’s price action was more chaotic unlike the yen’s somewhat uniform price action. And the reason for that is that Swissy and euro pairs were dancing mostly in tandem, although the Swissy didn’t really benefit a lot from the ECB statement and presser while gaining much more ground on Friday, probably because of safe-haven demand related to Hurricane Irma. After getting a good beating last week, the yen had its revenge and was this week’s top-performing currency. The trading week started quite favorably for the yen since it gapped higher against everything except the safe-haven Swissy, thanks to news over the weekend that North Korea successfully tested a hydrogen bomb and was planning another missile test, which naturally caused risk aversion to really ramp up. The yen then raked in even more gains (except against Kiwi) on Tuesday, thanks to the hardest one-day drop in U.S. bond yields since May of this year. And according to market analysts, the plunge in U.S. bond yields, which dragged global bond yields lower, was either due to intense bond-buying because of the persistent jitters over North Korea, or worries related to Hurricane Irma (likely both). Bond yields recovered a bit on Wednesday but resumed slumping on Thursday, thanks to continuing concerns over Hurricane Irma and because of the ECB’s comment about an implied future tightening move, market analysts say. And the same themes continued to play out on Friday, which allowed the yen to harvest even more gains. That was only a minor speed bump for the yen, though, and so the yen ended up as this week’s top-performing currency. Although the same risk-off themes also apparently favored the safe-haven Swissy, so the yen’s win against the Swissy was only razor-thin. The Loonie scored another broad-based win this week, which means that the Loonie has been a net winner for four consecutive weeks now. Amazing! And this week’s bout of Loonie strength was largely due to the BOC statement. Forex Gump already has the details on that, so read his write-up here, if you’re interested. The short of it is that the BOC hiked rates yet again, contrary to expectations that the BOC would only present a more hawkish tone or perhaps signal another rate hike. In short, if the Canadian economy continues to meet or beat the BOC’s expectations, then more rate hikes are to be expected. But then again, that also means that the BOC is open to cutting if the Canadian economy deteriorates. Anyhow, this unexpected rate hike and openness to further hikes apparently continued to fuel demand for the Loonie on Thursday. Although it’s also possible that savvy market players were opening preemptive positions ahead of Canada’s jobs report since the BOC did note that “Particular focus will be given to the evolution of the economy’s potential, and to labour market conditions” and as Forex Gump pointed out in his preview, Canada usually prints better-than-expected reading for jobs growth for the August period. And it just so happens that job growth in August did beat expectations (22.2K vs. 15.0K expected) and so the Loonie jumped higher as an initial reaction. Sadly, the quality of the jobs was not as impressive since the Canadian economy shed a whopping 88.1K full-time jobs, with the job gains coming from the 110.0K increase in part-time jobs. And that disappointing bit, plus the very hard drop in oil prices at the time, prevented the Loonie from jumping even higher. Even so, the Loonie still had a good showing this week. Oh, and according to market analysts, the rug got pulled from under oil’s feet (figuratively speaking of course) because of worries that Hurricane Irma would lead to more refineries getting shut down and lower demand for energy overall, which would mean lower demand for crude oil. The Aussie was a net loser this week, apparently because the slump in iron ore prices was weighing down on Aussie pairs, with the exception of the AUD/USD, but that has more to do with Greenback weakness rather than Aussie strength. And the slump in iron ore prices, in turn, was blamed by market analysts on the stronger Chinese yuan since that raised expectations that Chinese exports may slow, hitting the overall Chinese economy in the process. Oh, the RBA also announced its latest monetary policy decision during the week. And as usual, Forex Gump already has the details on that here. The gist of it all, though, is that the RBA kept the cash rate steady again while providing a positive outlook on the Australian economy. Overall, nothing really new, so the immediate impact on the Aussie’s price action was only minimal and most Aussie pairs appeared to be more focused on tracking iron ore prices. Also, RBA Guv’nah Philip Lowe spoke at the RBA Board Dinner in Brisbane later. But he basically reiterated the RBA’s overall message, so that was mostly a dud as well. 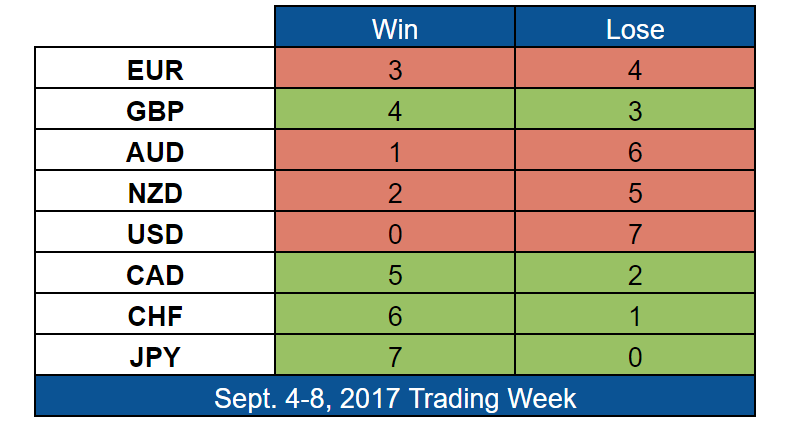 If the Loonie keeps scoring wins week after week, then the Kiwi is the polar opposite since the poor Kiwi got another thrashing this week. This marks the sixth consecutive week of net losses for the Kiwi. Poor, poor Kiwi. I’m not complaining, though. Woo hoo! And based on how price action played out, it looks like forex traders were opening preemptive positions ahead of Tuesday’s dairy Auction since the Kiwi was charging higher ahead of the event. Although risk-taking did temporary return at the time, which probably also helped the higher-yielding Kiwi. However, preemptive positioning seems more likely since the GDT price index increased by 0.3% (-0.4% previous) in the latest auction but the Kiwi reacted by jumping higher only to start sliding later while risk-taking still persisted. After that, however, it was just downhill for the Kiwi from there, as risk aversion returned mainly because of Hurricane Irma, although occasional headlines about North Korea, as well as expectations of tighter monetary conditions in the Euro Zone after the ECB statement also helped to dampen risk-taking a bit. Aside from risk aversion, some market analysts also pointed to election jitters ahead of New Zealand’s September 23 elections since the Labour and National parties that currently lead in the polls both have policies that may be seen as negative for the Kiwi. Both parties, for instance, want to add full employment to the RBNZ’s mandate, which could mean further delays to the RBNZ’s projected 2019 rate hike and is therefore net negative for the Kiwi.